Teddy (USC shirt) and Thomas (yellow shirt) stop for a photo with Alice Prevatt, Founder of Backpack Blessings, and her grandson. Ronnetta Griffin poses with a load of food to deliver to the UBB Food Pantry. On this frosty day, it warms my heart to be able to help this worthy cause! It was a Snow Day for Greenville County Schools so my sons Teddy and Thomas helped me load bags and bags of food into our Suburban so that we could make a run to Fountain Inn Presbyterian Church. We enjoyed a stop for lunch together and then we were so happy to be able to deliver a large quantity of food collected for Upstate ‪‎Backpack Blessings (UBB), as well as nearly $200 in cash donations. MANY thanks to Kasey Methot and her coworkers at Ogletree Deakins Law Firm in Greenville for having such an amazingly successful food drive last week. Thanks also to my neighbors for their generous donations! Alice Prevatt sends her love and gratitude! Sometimes a call for help is all it takes. I was so happy to be able to stay today and help unpack incoming food. 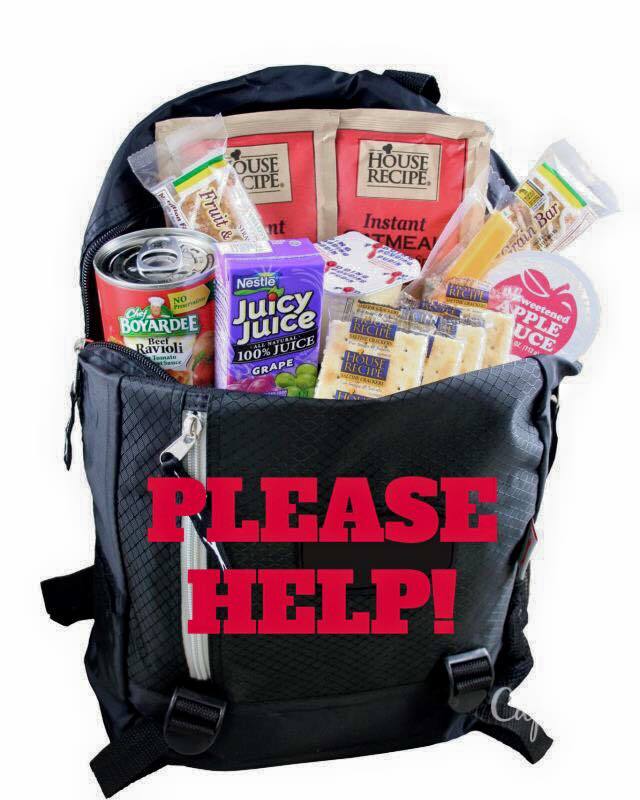 With multiple food drives coming in, the Backpack Blessings pantry is restocked for at least two weeks!!! Just last week, the shelves were bare with 200 children to feed over the coming weekend. Alice Prevatt, Founder of Upstate Backpack Blessings, sent out an emergency email and many folks were quick to respond. Today she sends her love and gratitude! You wouldn't believe all the work that's involved AFTER the food drives are held! Alice runs around town every day of the week picking up food if it's not delivered directly to the church. The food must be carted from vehicles all the way through the church building to the large room where the food is stored. Every food item must be checked for an expiration date, then it is organized, put on a shelf and accounted for. Alice runs around town every day of the week picking up food if it's not delivered directly to the church. The food must be carted from vehicles all the way through the church building to the large room where the food is stored. Every food item must be checked for an expiration date, then it is organized, put on a shelf and accounted for. Tomorrow is packing day. It is so heartwarming to see the care and thought that go into the packing of each bag that will be sent home with a student. You can see Alice in this photo making a list for tomorrow's bags. Each week she decides, based on the foods they have in stock, what they can send home with the children each weekend. Today, she was especially delighted because she will be able to send home two cans of fruit with each child on Friday. Alice said that she asks people, "Can you even imagine having lunch at school on Friday, going home and having no dinner, then no breakfast, lunch or dinner on Saturday OR Sunday, and then returning to school on Monday morning expected to be ready to learn? That is when you will know hunger." Alice saw this firsthand when she worked for years in a middle school cafeteria. The Backpack Blessings program started in Alice's kitchen serving 3 schools. It quickly grew and now serves 23 schools including my boys' schools -- Riverside Middle School and Eastside High School. It also serves Riverside High School, Hillcrest High School and numerous elementary and middle schools. Alice says that once a child starts with the program in elementary school, if things don't change at home, that weekly bag of food typically follows them all the way through high school. I asked Alice, "What is the #1 item you would like to have stocked in this pantry that you don't currently have?" Her answer was individually cartons of white milk (like Yoohoo but white for use in cereal, grits and oatmeal). She said it's difficult to find and can be expensive. The #2 item is small boxes of cereal. She takes the cash that is receives and shops at Aldi, Save-A-Lot, local grocery stores, Costco and Sam's -- wherever she can find the best deals to get the most food for the kids. We offer the God-given talents we have and I told Alice that I'm going to help her with social media and a website for the program. Hopefully that can bring more awareness and more donations to the program. This is truly a faithful woman doing God's work. If you've ever thought about donating to or volunteering for a cause that goes directly to helping people in a tangible and immediate way, this is it. Look for more info to come about how YOU can help...because hunger certainly does not take a break on the weekend. If you're visiting this site because you have participated in a food drive, THANK YOU. If you are thinking of collecting food, THANK YOU. Please send us photos of your UBB Food Drives and we'll post it here and on our Facebook page. Alice Prevatt, left, Founder of Backpack Blessings pictured with Ronnetta Griffin during a food delivery. Proverbs 22:9 - He that hath a bountiful eye shall be blessed; for he giveth of his bread to the poor. This wonderful program helps nearly 200 students each week, and the Holiday Break is a LONG time to go without food!!! Multiple families living in one hotel room...families living under Interstate overpasses...children living with grandparents who are on a fixed income while their parents are serving in the military and deployed overseas...THESE are the children your donation can help! We also want to at least send a candy cane home with each student...but the pantry is bare and funds are so limited this year. Thank you so much for your help! Please email me at ronnettagriffin@yahoo.com to schedule a pickup!